This entry was posted in Business culture, Non-verbal and tagged France. Bookmark the permalink. 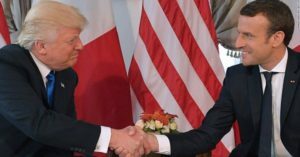 Across cultures, handshakes can be viewed in various ways but ultimately I think common sense would indicate that you should not pull on the newly elected French President’s hand, as Trump did at the time. Even with understanding that handshakes are a way to show assertion, diplomacy is not the same as business and should not be treated as such, in my opinion.